Sudanese security authorities on Tuesday arrested a group of university professors and a number of journalists for organizing set-in against the excessive use of violence against peaceful demonstrators. The sit-ins were organized after a call by the Sudanese Professionals Association (SPA) to organize sectorial vigils and demonstrations on Tuesday within the framework of its nearly two-month protest campaign demanding the resignation of President Omer al-Bashir. 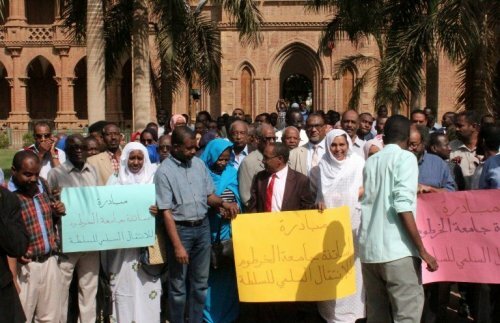 The security forces surrounded the professors and lecturers from different universities who gathered at the premises of the University of Khartoum professors where the teaching staffs from different universities staged a sit-in and arrested them. Eyewitnesses told Sudan Tribune that 16 professors were arrested, including a SPA leading member Mohamed Youssef Mustafa, along with 8 professors from the University of Khartoum and 5 from the University of Nileen and a professor from the University of Bahri. In a related development, the security forces prevented a second sit-in organized by the Sudanese media professionals who gathered in front of the buildings of the Ministry of Information and arrested dozens of people before releasing them later during the day. Also, a number of hospitals in the capital have witnessed silent protests organized by dozens of doctors. Despite, the continuation of protests and the growing popular support in the country, the government of President Omer al-Bashir refuses to take political initiative or to ease the violent repression on the protesters creating a chronic political crisis that tarnish its image.